Mes chers, to the left take a peek at Sperry Top-Sider’s sassy little summer perfect Southport Slingback Wedge in Red; to the right brace yourself for a swoon-fest over Dexter’s magnificent Megan Canvas High Wedge Sling in Red via Payless. Though the darling Dexter’s sport a slightly higher wedge than their Southport sister; for a mere $16.99, as opposed to the $89.95 required to spruce up your shoe collection with un petit Sperry Top-Sider action, they are le perfect way for the budget babe to get nautical this summer – at a price that allows one to scoop up both Hamptons-esque shades (Red and Navy)! 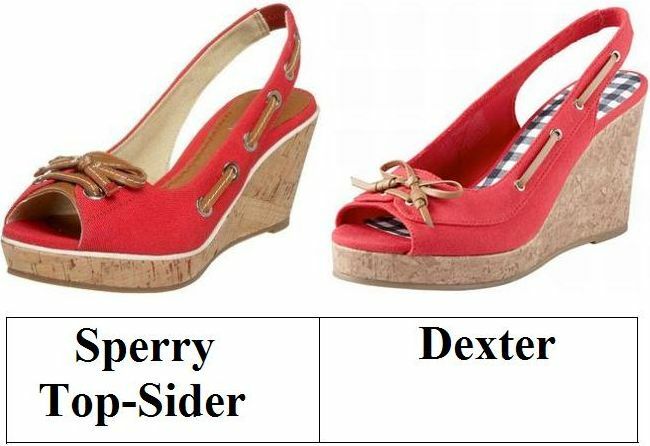 Tell me, kittens…will you be a big spender and go for Sperry Top-Sider, or be thrifty and spring for Dexter? Thanks to Nordstrom and Payless for the pictures. Wow, I even like the name Dexter, too. Great price. Such a sweet shoe for spring and summer. I definitely like the Sperry better. My daughter says Sperry Top-siders are all the rage on campus with the college set. These scream my MOM! She loves this style. I will have to show her. I actually like the Dexter ones better! Cool! Perfect for the sailor looks! Great find but neither of these are particularly suited to my taste! I have been missing you lately - life has prevented my visits. Sorry about that! OK I love them both but me, being a shorty would spend the extra $$$$ on those Sperry Top-Sider. why are the more expensive ones always nicer? Hey Erica, did you get my email? I haven't heard back from you and I thought that was unlike you so thought I'd check. Let me know! TT's Attic - Shop Online! If I was going to splurge on Sperrys, I'd probably go classic over the wedges. $16.99 is so impossible to pass up, especially with those beautiful shoes. Totally, totally going with the Dexters. I like the Dexter a LOT more! I love when that happens :) This wedge would be so perfect for a summer afternoon of sailing! I just bought a pair of Sperry's yesterday! I don't know how they are as I have not really walked around in them a ton, but I love the fit already. Getting a pair of wedges is ultra tempting! Great shoe for this time of year. Looks great. Those wedges are a must for the summer! And $16.99 for the Dexter? Amazing! omg these are so cute Erika, and actually don't look too high! I'm so going to check these out. I really want a pair of cork wedges right now! Happy Cinco de Mayo my dear! i like the dexter ones better, so i'd be thrifty! Great shoes! Love them both but since they looks practically identical, I'll go for the Dexter ones since they're at sch a great price! That's a good match! I really couldn't pass up Sperry's though. Oh my gosh those Dexter ones are so affordable! Is it just me or do these remind you too of Tom;s a bit? So love the cheaper price. Wow, terrific! So love these. Especially at that price! Thrifty, here. hi erica,, been a long time no catch up.. i miss your post..
and hey those shoes are similiar..
i prefer the cheap one ofcourse..
still, i love those colour.. These are fabulous! I can imagine walking through the beach in them. I love the Sperry ones! Those sandals are so beautiful! I would choose the Dexter ones, though! oh i really like the Dexter wedges better because of that nice checkered design. Wow they look almost identical!! They're so so cute for springtime!! Love love lovee!! Wow so cool! I'm new on blogspot.com. So I was wondering if you could check out my blog and tell me whatcha think.